Do you have any questions? Or do you need a different floor than a PU resin floor? Arturo offers a choice of a wide range of resin screeds, pebble flooring, floor coatings and epoxy resin flooring. Our flooring specialists are happy to provide expert advice on the most suitable flooring system for each specific situation. Resin floors are easy to combine with under floor heating as resins easily absorb and release heat. This makes it a particularly suitable for under floor heating. High demands are placed on floors – both by the user and by rules and regulations. Each floor, function and specific load is accompanied by specific requirements. Arturo knows these requirements like no other and carefully responds to them. The colors of the Arturo Colour Collection® are available in two types of polyurethane self-smoothing floors. Floors for a light load. It is highly elastic, UV-resistant and offers highest walking comfort. Ideal for homes and stores or, for example, restaurants, museums and showrooms. For light to medium loads. Ideal as a finish for floors in schools, laboratories, hospitals, print shops, canteens, technical rooms, etc. The construction of a resin floor depends on the substrate (concrete or cement / anhydrite) and the chosen structure. 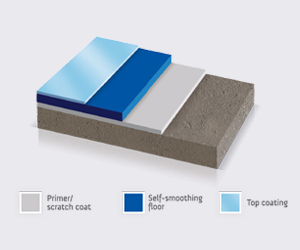 In general, the construction of an Arturo self-smoothing floors such as Arturo PU2030 or PU2060 Self-Smoothing Floor takes 3, 4 or 5 days. After 24 hours, the floor can be walked on and after 72 hours, you can place furniture etc. on it. Arturo Self-smoothing floors are being applied in several layers. Discover how a self-smoothing floor is applied. Polyurethane floors have characteristics that are worth discovering. Arturo resin floors are being made by professional contractors.